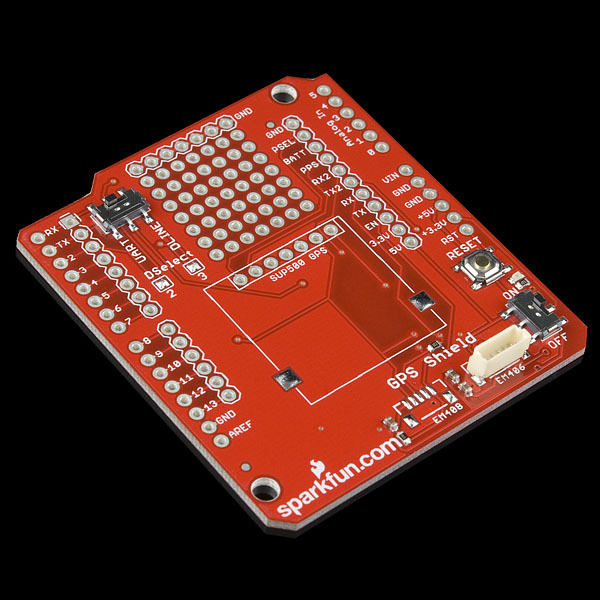 Adding GPS to your Arduino has never been easier. Multiple GPS receivers attach easily to the shield, and with the example sketch (check below), you will be able to locate your exact position within a few meters. Here's where we are. GPS also gives you amazingly accurate time! A connector for the popular EM-406 GPS receiver is populated on the board, and footprints for EM-408 and EB-85A connectors are also made available (connectors are not included and can be found below in the related items). 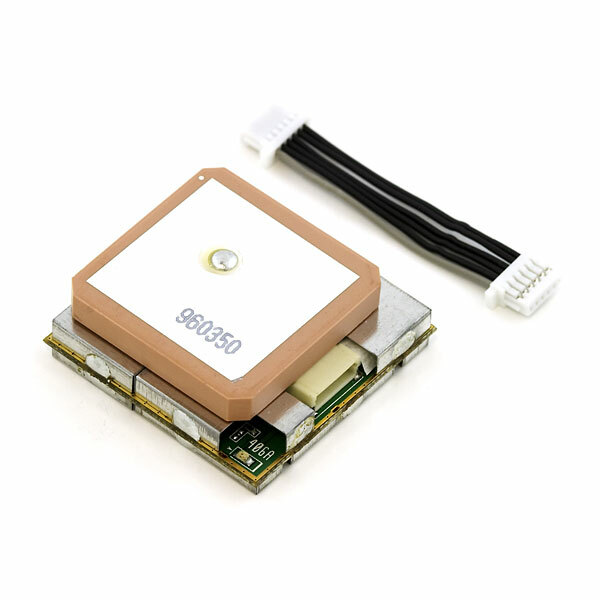 There is also a spot for the UP501 GPS module. The regular GPS pins (RX, TX, PPS, etc.) are also broken out to a 10-pin 0.1" pitch header, and a small protoyping area is also provided. I have Arduino GSM shield mounted on Arduino uno. 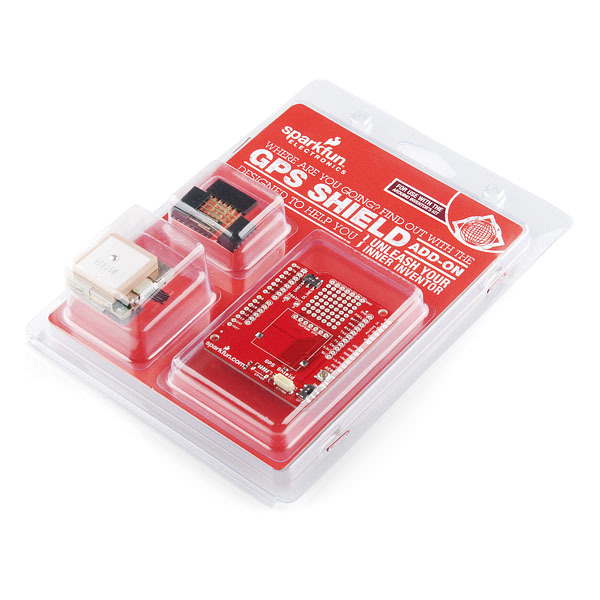 Can I stack this GPS shield above Arduino GSM shield ? Will there be any pin configuration problem ? If there is any problem, how it can be solved. I have had some problems with this GPS. I can get the coordinates and other information but sometimes after I switch off and on again (or after upload a new code to Arduino), it takes forever to get the signal. Sometimes just disconnecting from the power and connecting is enough but sometimes takes 1-2 hours and that drives me crazy. Is someone having the same problem or know how to solve that? when it will be in stocks again? I purchased many of these components induividually, and i have been running into a problem. The GPS i bought is an EM406, and appears to be the same one as the one included in this kit. However, I have been told elsewhere i have to make sure my GPS isnt outputting in RS 232 format instead of serial. I dont exactly know what this means, i know there is a RS232 to Serial shifter, but im confused. Anyone have any suggestions? 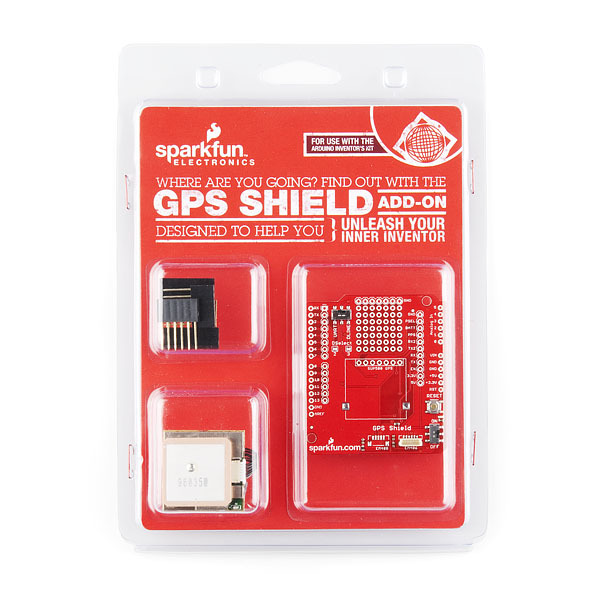 I am using an arduino UNO (or Yun I have both), the GPS shield shown here, and this (https://www.sparkfun.com/products/465) GPS. I dont know why i am having such huge issues. Is this compatible with the Arduino Due? I assume so but just want to make sure there are no issues due to the Due being 3.3v based? Can anyone help me this working? My serial monitor is outputting 0Â.ÂNÂ²Ã¾ and nothing else. Is it possible I soldered it wrong? What might be the issue? I think we got this question answered already, but for anyone else running into the same issue, please double check that all your baud rates match up correctly, and your connections are good, withe proper power to the module. Does anyone have anything to say about how the "course" readings given by this module are? The example sketch above and examples with the TinyGPS library make use of course() and f_course() functions. How reliable are these values, and does anyone know how they are determined? Is their a digital compass within the unit or is it extrapolating recent GPS data? Although some GPS modules include a magnetic compass, this one does not. Thus it comes up with course and speed by looking at the difference between the current fix and the last fix. (The device is probably smoothing between several fixes, but essentially that's what's happening). Course and speed will be more accurate the faster one is going (which gives a greater distance between fixes), and if you're standing still, the course will be effectively random, but the speed should accurately be near zero. Note that it's the GPS module itself that does this; TinyGPS just pulls those values out of the GPS data. Works very well with a few modifications to Aaron's sketch. 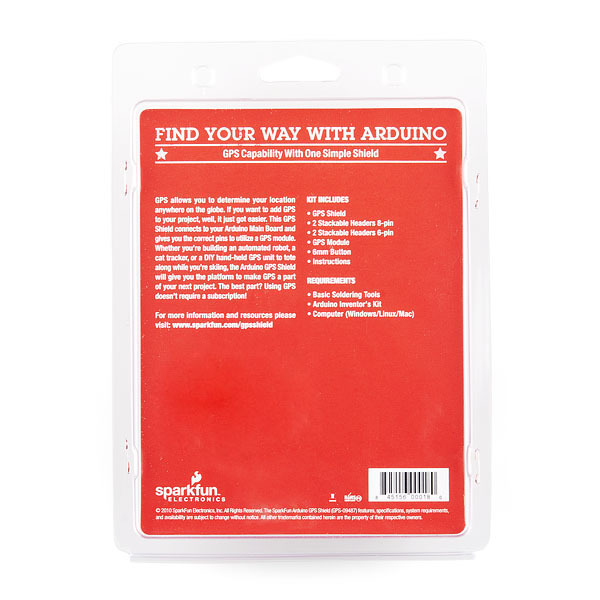 Thank you Sparkfun for not only providing a good product, but some tools to help us newbies out. I look forward to purchasing more shields. Got the shield, soldered the headers on, had a GPS fix in just a few minutes. Couldn't be happier. Doesn't the this(the retail kit) come with the EM406 GPS receiver? Seems to be a copy/paste of a similar product (without the packaging) description. The picture of the packaging shows the GPS chip clearly (bottom left). Can you connect the 66 Channel LS20031 GPS 10Hz Receiver (sku: GPS-08975)to this shield?